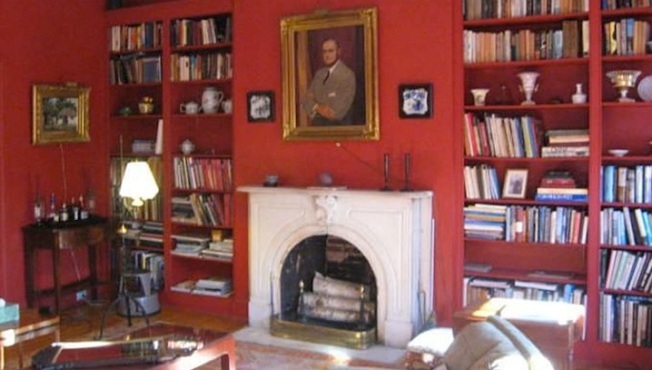 The historic home of F. Scott Fitzgerald could be yours for $450,000. According to Curbed, the Baltimore home that F. Scott Fitzgerald lived in with his wife Zelda has hit the market. After penning "The Great Gatsby," he moved into the home in 1932. His time there was not a happy one though. While attempting to finish "Tender Is The Night," he experienced a bout of depression and drinking which drove him to produce his most dark and dismal works. Built in 1900, the Bolton HIll home retains its original elegance, with many of the details untouched, like ornate mantels, velvet Louis chairs, floral wallpapers, and timeworn valances. Inside the 3,600 square feet, there are four spacious rooms with generous closets, and large first and second floor porches overlooking a private garden and garage accessible by double French doors. And in case you forget that you're in a landmark of literature, there's a plaque reminding you that F. Scott Fitzgerald was here. It's left up to the imagination of the owner to remember how he wrote here and drank here, too. And how much would you pay for that? The asking price is $450,000. It is yet to be seen whether Fitzgerald fans will agree if that's a reasonable price to live in a home so historical.